If you’re looking for a quick, one-pot, midweek meal – try out my healthy chicken curry. For me, a curry tastes best with white rice. I like to use SunRice Low GI white rice because it tastes amazing and it’s a healthier option. I’ve been eating it for years (since I was about 13)! Thanks mum for getting me onto low GI rice! You may already know that choosing Low GI carbs can help you get more sustained energy. This is especially handy when the family prefer the taste of white rice but you want a healthier option. 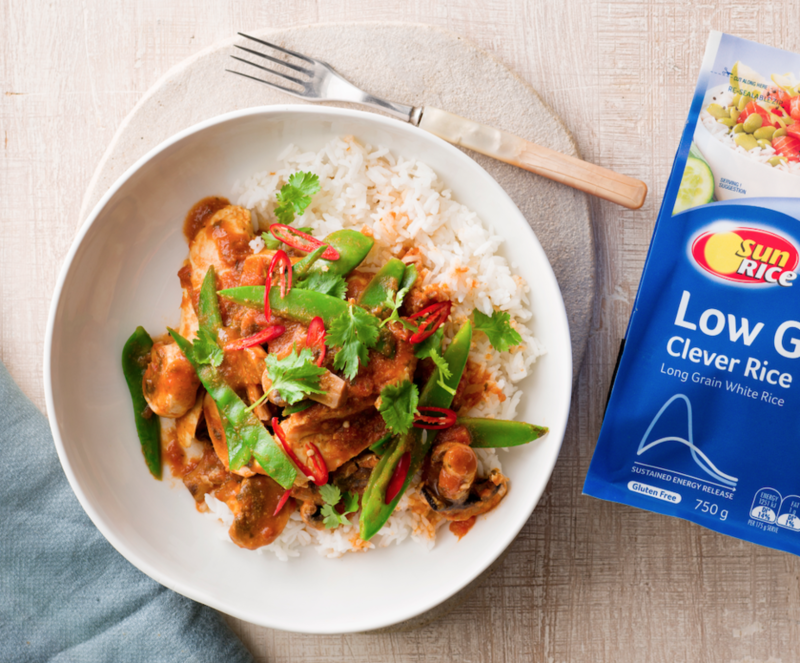 SunRice Low GI White Rice is a variety of long grain rice, called Doongara, which is exclusively grown in Australia. Plus, rice is naturally gluten-free which is handy if you’re sensitive. Adding a dollop of plain Greek yoghurt before serving makes the curry extra creamy and delicious. If you prefer a mild tasting curry, be sure to use a mild curry paste – or reduce the curry paste to 1 tablespoon. Anyway, I hope you love this recipe! A deliciously simple and healthy 20-minute, one-pot chicken curry. Serve with fluffy low GI white rice and enjoy minimal cleaning up after. In a large saucepan, add oil and half of the curry paste, and cook on high. Once hot, add the chicken strips and cook for 5-7 minutes or until cooked. Add mushrooms, snow peas, tomatoes, stock and the remaining curry paste. Bring to the boil and cook for 5 minutes. Serve with SunRice Low GI steamed rice and a dollop of Plain Greek yoghurt, for extra creaminess. Enjoy! Disclaimer: I love SunRice. That is why I partnered with them as their Health and Wellness Ambassador. Thanks to SunRice for giving me the chance to create this recipe!